Get Professional Assistance! EVERY TAX PROBLEM HAS A SOLUTION! Let Us Help Rescue You From Your IRS Tax Debt! Please call us so that we can start guiding you to your own personal tax solution today! 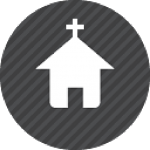 Learn the benefits and essential steps of church incorporation and other information for clergy and church leaders. Learn critical tax information on several major subjects including tax liens, tax levies, payroll, and more. ClergyZoom provides valuable assistance and tools for current 501(c)(3) organizations and startups. 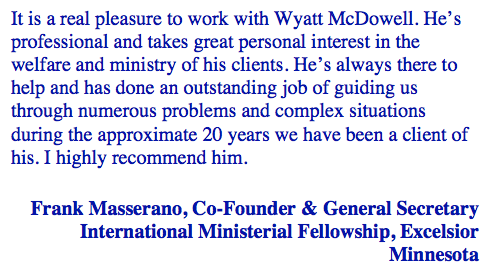 Wyatt McDowell provides a wide range of consulting services to churches and ministries across the United States. Over the past 25 years, Wyatt McDowell has assisted literally hundreds of churches and ministries of all types and sizes. Churches and ministries today are facing a host of new operational, governance and legal challenges. These include heightened scrutiny from the IRS, increased governmental regulation, and the threat of lawsuits from church members and members of the public. Our passion is to assist your church or ministry with these challenges. Contact us today for a consultation at (740) 938-4067 or fill out the form on our contact page.